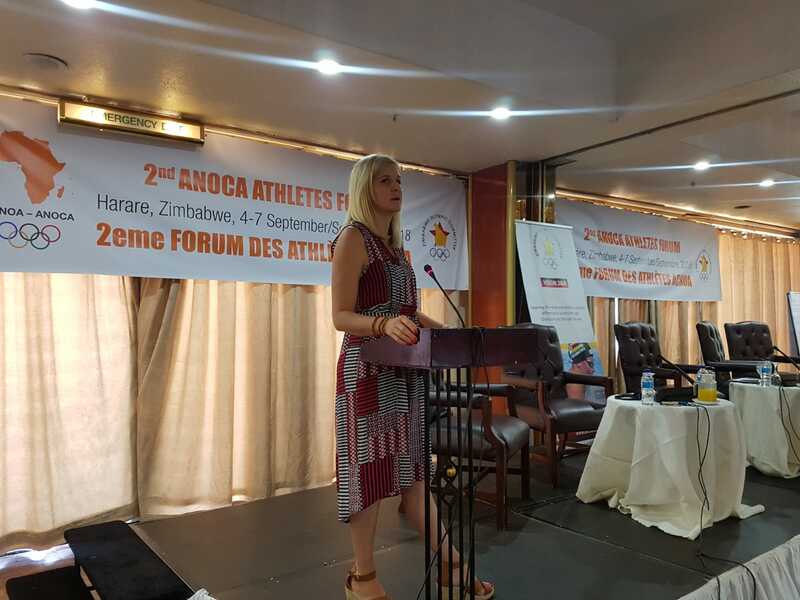 More than 100 participants from 34 countries came together in Harare, Zimbabwe, from 4 to 7 September for the 2nd Association of National Olympic Committees of Africa (ANOCA) Athletes’ Forum, which focused on empowering athlete voices and addressing issues specific to the continent. The Forum was the first of a new style of continental athletes’ forum that aims to forge a tangible link between the Continental Athletes’ Commissions and the IOC Athletes’ Commission (AC). The Forum provided a strong and interactive platform to discuss challenges specific to the continent, while also highlighting topics that are relevant to athletes globally. The objectives of the forum were for participants to be informed about the Olympic Movement and resources available to them, understand the needs of African athletes and find ways to communicate effectively with each other as a network, so athlete representatives feel empowered to effectively run an Athletes’ Commission. Also on the agenda were updates on the work of the International Testing Agency, WADA’s anti-doping outreach programme, presentations on the prevention of harassment in sport and the World Olympians Association and multiple sessions focused on ensuring that African athletes were aware of the resources available to them through the IOC, ANOCA and Olympic Solidarity, the latter of which provided vital funding that made it possible to host the Forum. Olympic Solidarity plays a fundamental role in development of sport and supporting athletes globally and has increased support for athletes particularly in the areas of career transition and providing engagement opportunities for athlete representatives by funding these Athletes’ Forums across five continents. Effective communication was a key emphasis, and the importance of meaningful collaboration between NOCs, ANOCA and wider ACs was discussed at length. Significantly, the Forum provided a unique opportunity for African athletes to voice their views on an international stage to key stakeholders within the Olympic Movement. Olympic basketball player and member of the ANOCA AC Kady Kanoute Tounkara, who represented Mali at Beijing 2008, said: “The Forum has offered a great platform for us to interact with our African athletes’ representatives. Following two-and-a-half days of productive dialogue, participants agreed on a number of recommendations to be put forward to the IOC AC and ANOCA. The aim is for all African NOCs to have an established and active AC in place before the end of 2020 – with at least one representative with a seat on that NOC’s executive board – and that a primary focus of each AC should be to work towards the implementation of the IOC Athlete Career Programme at local levels. In addition, agreements on recommendations for funding support from African NOCs and their ACs were reached. IOC AC chair Kirsty Coventry was in attendance and stressed the commission’s desire to provide an empowering link between athletes and the IOC at large. During the four-day event, it was also announced that Coventry, 34, has been appointed as Zimbabwe’s sports minister.